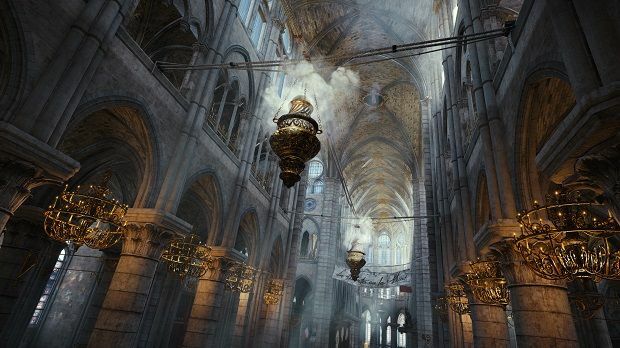 The Paris depicted in Assassin's Creed Unity is shaping up to be a juggernaut among videogame cities. Larger than all other Assassin's Creed locales to date and significantly more detailed, the development team is taking whatever steps are necessary to make Paris the true star of the game. That might not be any more evident than in the case of senior level artist Caroline Miousse. Miousse had worked on titles with tremendous scale before, as she was a designer on the likes of Assassin's Creed II and Assassin's Creed III. 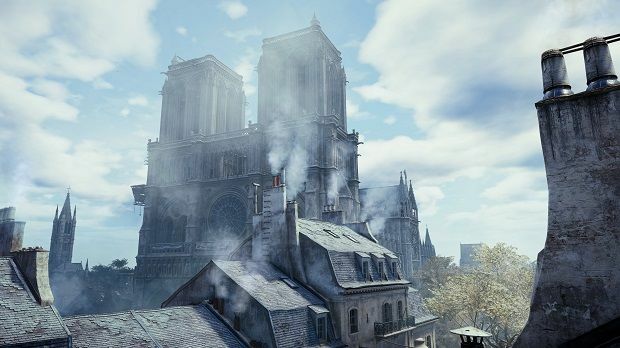 But, in the process of planning Unity, Ubisoft approached her with an interesting prospect -- create the Notre Dame, perhaps the most famous of all cathedrals in the world. 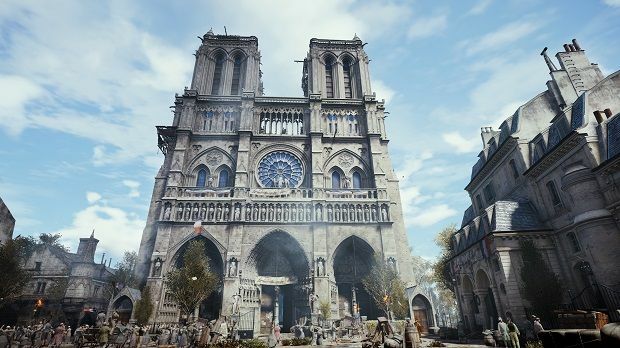 All along, the development team had big things pegged for Unity's take on the Notre Dame. When talking to the game's art director and world design director, they immediately pointed to the monument as the single best example of a landmark that got preferential treatment -- partially because of how breathtaking and iconic it is, partially because it's the perfect subject to benchmark development on new consoles. Miousse was honored to be put in charge of such an important individual aspect of Assassin's Creed Unity, but it didn't come without a bit of trepidation. "I was pleased to do that; it was very exciting," Miousse said with regard to Ubisoft pitching the idea to her, "but there was a little stress at the beginning because you really need to be sure that you're recreating it as accurately as possible because it's so well known." As if this undertaking wasn't overwhelming enough, Miousse was working with a disadvantage in one sense -- she hadn't actually visited the Notre Dame. To see pictures and video of it is one thing; to actually stand in front of it, neck craned back as you stare at its impossible ornateness is altogether different. Still, that stress began to slowly melt away as Miousse started the project. Working with a historian, she researched what every individual section of the cathedral looked like during the French Revolution and went about making it as faithfully as she possibly could. She likened it to building with Lego blocks, an activity that becomes easier as you progress. Seeing that the Notre Dame was prioritized in the development of Unity, a main goal was to recreate it 1:1 to stay as true as possible. That means that Miousse was almost literally putting the cathedral together brick by brick. The size seems to have been a welcomed challenge that she reveled in. "I want the player to feel tiny when scaling it," Miousse stated. This task alone is a lot to ask of one person, but some unique problems started popping up. Some of them were exclusive to videogames. For instance, new hardware allows for seamless transition between interiors and exteriors, eliminating the ability to "cheat" and make them wholly separate. Another issue was that the Notre Dame wasn't built with the idea that it needs to be a gaming space in mind. So, some liberties had to be taken with item placement to create paths through it across many different levels. Creative license was also taken with regard to much of the artwork inside the Notre Dame, but not by choice. Much of the art that adorns the cathedral (such as the stained-glass windows) is protected under copyright law. This gave Miousse the opportunity to put her own personal touch on her interpretation of the church. When asked if it felt odd to take liberties with a collection of decor that's so esteemed, Miousse eagerly denied it saying "No, it's very fun! We get to put a little bit of our own identity on an iconic monument." And, that's how Miousse recently spent more than two years of her career -- recreating the Notre Dame with painstaking detail. After her work was complete, she finally got the opportunity to visit it in person. Upon seeing it for the first time, her eyes lit up with glee, she bent slightly at the waist in disbelief, and she brought her hands to her mouth to partially cover her glowing smile. Two years of her life had been validated in an instant. "It felt really good; it was an achievement," Miousse said of laying eyes on the Notre Dame. "It confirmed to me that what I made was right." She continued "Videogames are all about getting emotion out of the player. I think the experience that I had in mind for the player was the emotion that I was feeling at the time." Miousse felt an immediate comfort in the Notre Dame. In a place she had never been before, she knew what every nook and cranny had in store. While Miousse relished the opportunity to explore the intricate details of a landmark she was already familiar with, that relaxed, relieved, and satisfied demeanor never left. She summed up the experience by simply saying "I felt like I was home."